Take the stress out of the start of your Morocco vacation by pre-booking this private arrival transfer from Marrakech Menara Airport. Simply select a time to suit your flight arrival, meet your professional driver in the arrivals hall, and hop inside your comfortable, private vehicle. Then, relax as you travel to your Marrakech or Palmeraie hotel in style. Nothing could be easier or more convenient! 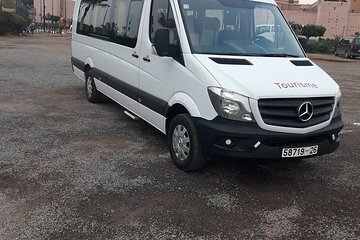 Reserve su traslado privado de ida y vuelta y, después de aterrizar en el aeropuerto de Marrakech Menara, conozca a su conductor privado y aborde su vehículo privado con aire acondicionado para viajar directamente a su hotel central de Marrakech o Palmeraie. Sumérgete en el cómodo interior, y relájate y disfruta del generoso espacio para las piernas mientras te mueves, de manera suave y eficiente, a tu alojamiento. Es una excelente manera de comenzar sus vacaciones en Marruecos y evitar la molestia de usar el transporte público. Ya sea que viaje solo, en pareja o en grupo, sus necesidades de transporte terrestre se cubrirán con este servicio de transporte privado las 24 horas, los 7 días de la semana. Al reservar este traslado privado de llegada, informe los detalles de su vuelo y los detalles de su hotel en Marrakech o Palmeraie. Su transferencia se confirmará de inmediato y se le entregará un cupón de viaje para que se lo presente al conductor. El precio es por persona, basado en 6 adultos por carro / vehículo. Confusing, couldn't find driver. Had to wander around outside and finally found the van. We were to have been met by a man holding a sign but this didn't happen. We wandered around and finally a man came up to us and called our name. - very disconcerting. We were ready to take a taxi which would have been significantly cheaper. Overall, not a good experience. Afraid got org to a slow start as our driver was not on the concourse holding a sign as advised. At the Viator stand another official incidentally sporting a TUI badge and a clipboard was not initially helpful in explaining that he might be able to help. Eventually a driver appeared but he really could have been anyone! Our trip to hotel was painless and it's a good way of ensuring you do not get confused by the taxis when you first arrive. We arrived late, my Mum's luggage got lost...but they still waited for us, and then the guide took us into town explaining some key things to know about staying in the Medina. Just lovely service and very caring. Was hard to get information about who was going to meet us and where before we went but in the end it couldn't be simpler as we just located the Viator stand in the airport. Air conditioned transport with english speaking driver. Collected late as driver could not find the address. We waited outside in the boiling heat for over 45 minutes! Driver was over half and hour late after re confirming the collection time when we arrived in Marrakech. When the driver did arrive there was no apology for being late or acknowledgment of hello or goodbye. Late and unfriendly service!